Traveling with a dog is hassle. 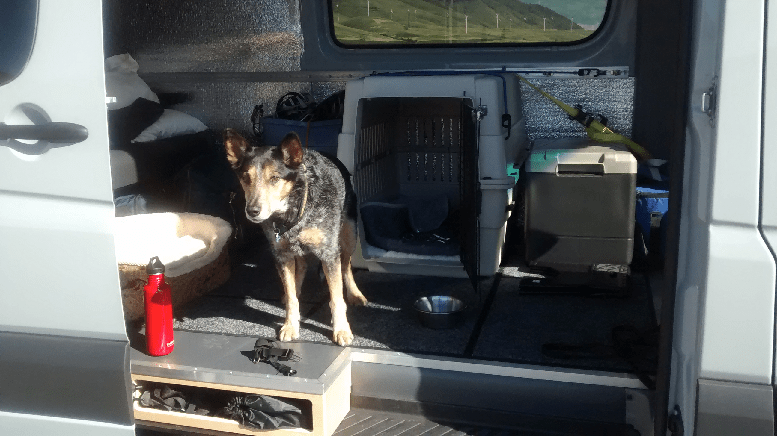 Traveling with a dog in a van is considerably less hassle than doing it in a car. Here are some of the things we’ve done to make life easier for ourselves and our dog. While we’ve moving from location to location, our dog has a specific place in the van, and we clip her in to a harness. An EMT friend of ours has told us multiple stories of stunned, injured pets wandering around on the road after an accident, too scared to be caught by the emergency services, while their owners are unconscious or trapped in the crashed vehicle. We don’t want that to happen to our dog. I’ve seen some vehicles where the dogs ride on the co-driver’s or driver’s laps, or on the front dash. Not only is ours slightly to large for that, but it would be much too distracting/dangerous for us and the dog. When we’re parked up and inside the van, there’s not much room to maneuver. Having the dog underfoot would just be additional hassle. In the house, we always trained our dog to go to her bed when given a command. It’s no different in the van. We bring her bed from the house, so that she has an item that smells familiar and feels familiar. The bed has sufficient cushioning that she doesn’t get vibrated around too much by bumps in the road. She can easily sleep while we drive. In our car, she wants to look around (outside) for the first ten minutes, then settles down. In the van she just settles down straight away. 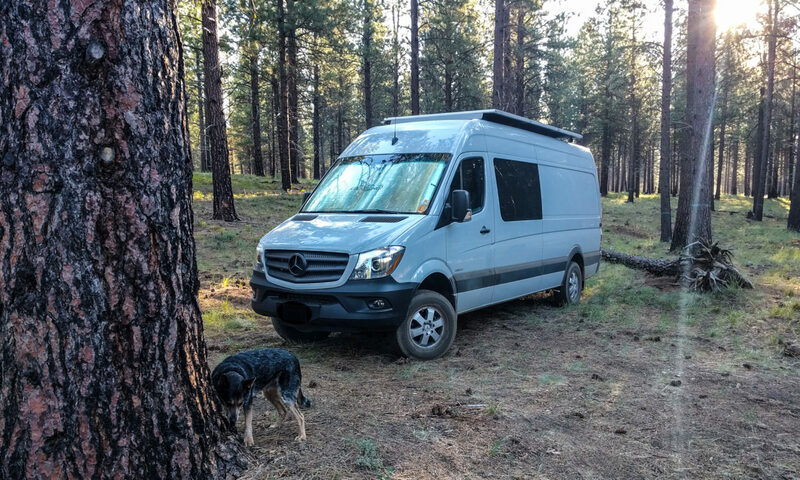 If we need to, we can move the bed to different locations in the van – for instance up between the front seats if we’re camping overnight, or back to the bench seat area for when we’re doing food prep or driving. The dog has learned to stay in her bed while we’re busy. We started that conditioning early – even while we were still working on the van interior in the driveway. In a crash, any loose item is going to make its way to the front of the vehicle. That includes the dog. She could hurt herself or hurt us. In a sudden stop, an object can have a force of up to five times its regular weight. 250lbs of dog coming at us from the back of the van is a bad idea. To stop that from happening, we use a harness. 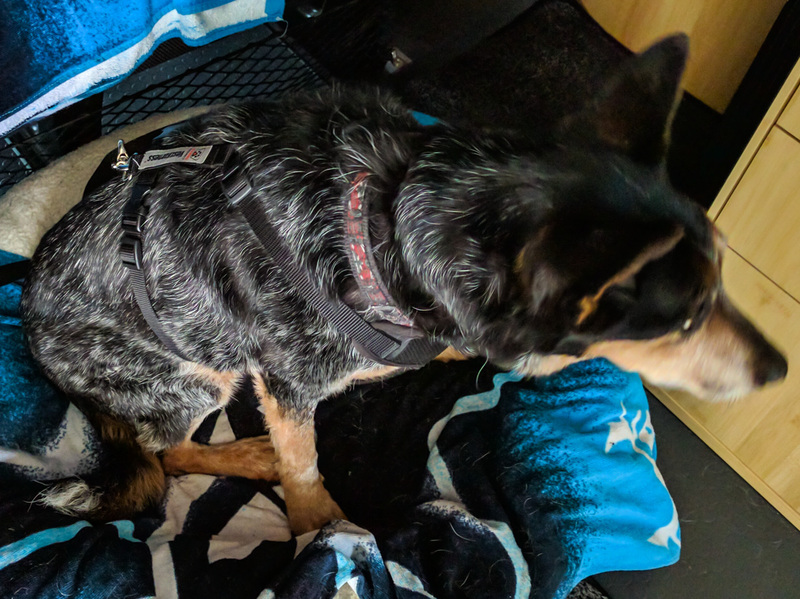 We strung a 1-1/2″ webbing strap between rings in the L-track on the van walls, and added a clip that we can attach to this vest harness made by Canine Friendly. Every part of the system has a rated strength of at least 500lbs. The harness comes in different sizes for various dog breeds. Our 45lb dog fits in a Medium harness. 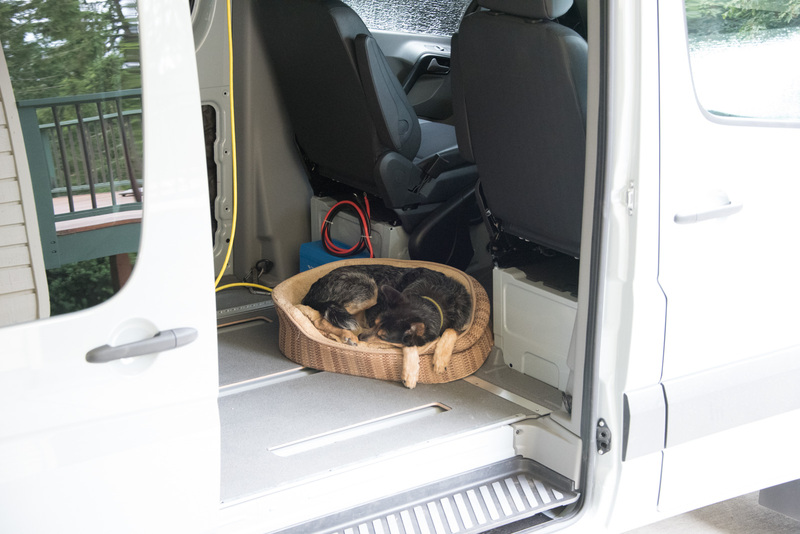 Before we finished fitting out the van interior, we did use a dog crate for a while. It was fine except it takes up a lot of room, and it was hard to position it in the van so that the crate door opened in to a location that the dog could get out easily. The best place for the crate was in the sliding door area, which meant the crate door opened on to the door step. Now with the cabinets in the van there’s not really enough room to keep using the crate. The dog’s crate took up too much room inside the van. We only used it on one trip. Draping a moving blanket, thick comforter, or similar sound-absorbing material over the crate will reduce the noise considerably. We did this for our dog in the bare van before we fitted out the interior. Our van does not get hot in the sun in the same way that a car does. We cover all of the windows with reflective shades before we leave, and the metal areas of the van are well insulated. The insulation in a conversion van is likely to be much better than a regular vehicle. Ours is good enough that the temperature inside the van seldom rises above the ambient temperature so long as we put shades in the window and run the vent fan. Obviously parking in the shade helps too. We have not and do not intend to leave the dog in the vehicle on days where the temperature is likely to get above 80 degrees Fahrenheit. Of course, that’s much easier in the Pacific NorthWest than it might be in Texas or Florida. We always leave water available for the dog. Her regular water bowl worked OK, but you can also buy ones specifically made for use in RVs which are harder to spill. One brand is “Buddy Bowl“. All of our food is in closed containers inside drawers and cupboards. 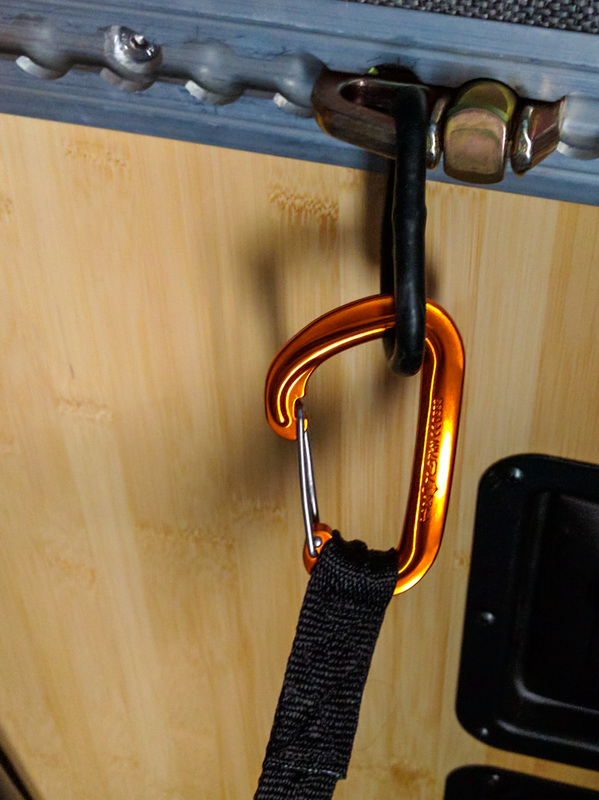 We do this primarily to stop mice from being attracted to the van, but it also works well to stop the dog from getting into things she shouldn’t. We had some issues forgetting to disarm the motion sensor for the van’s alarm system but we got around that with some strategically placed pieces of electrical tape. Our dog is old, so she’s much happier hanging out in the van than outside. However, when we’re outside, she’s OK on a long line strung between two trees, with a sliding leash line to her collar. This way she gets to explore, but also gets to hang out in the shade as she sees fit, and to pick herself up and move as the sun crosses the sky. If you’re camping in tick infested areas, make sure your dog’s tick meds are up to date. Our dog has a scar on her nose from where a vet didn’t quite remove the jaws of a tick that she picked up, and the whole area went septic. Avoid the cost and the pain to the dog and give them the medication. We’re not big fans of finding dog poop in the locations we stop to camp, so we’re also considerate to future campers. We pick up our dog’s poop and leave the poop bags by the front wheel of the van. When we leave, we put all the poop bags in a big ziplock and dump that in a suitable trash location when we’re back in civilization. The ziplock is enough to stop the poop smell from permeating the vehicle. Traveling with a dog is more hassle than traveling without one. You have to stop at rest areas long enough for the dog to pee or poop, and think about dog mealtimes as well as your own. Even when you reach your destination, it’s not always possible to find good shaded parking to leave the dog in the van. We’ve had to change our plans a couple of times because of this type of situation. However, having the dog with us gets us into interesting conversations with people and gets us exploring areas we otherwise wouldn’t have, just because we have to take the dog for walks. And obviously there’s the companionship aspect too. The dog is great to have around and it’s fun to share our adventures with her. We have a few events planned that will take hours at a time where the dog cannot go. We plan on looking for doggy day care facilities on these days. Any other ideas or thoughts on this? Lynda, there are some times when it’s just not fair on your dog to be locked up in the van, even if it is technically possible. Like you, in those situations we used doggy day care or boarding facilities, or a friendly neighbor who could let the dog out to pee if we left her at home.